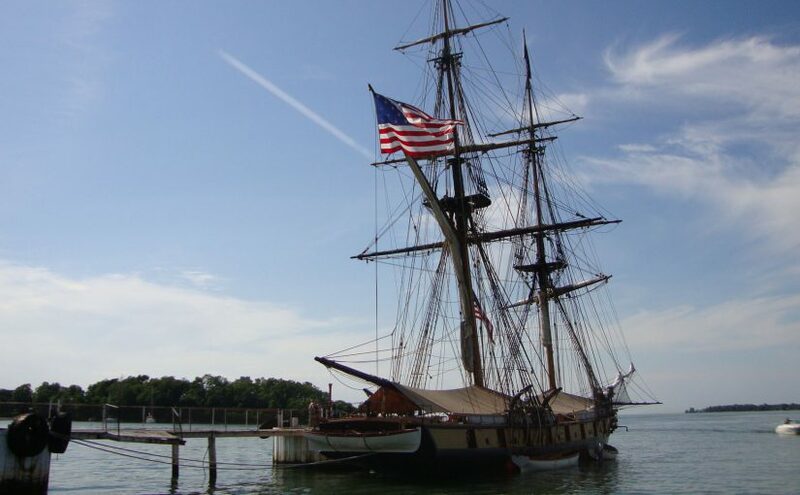 The United States Brig Niagara in Erie, Pennsylvania is a reconstruction of an early 19th century warship of the United States Navy involved in the Battle of Lake Erie. On September 10, 1813, nine small ships defeated a British squadron of six vessels in the Battle of Lake Erie. This pivotal event in the War of 1812 secured the Northwest Territory, opened supply lines and lifted the nation’s morale. Six vessels in Perry’s Fleet, including Niagara were constructed in Erie. Building of the American squadron was a remarkable feat, given Erie’s mere five hundred inhabitants and remote location. Shipwrights, blockmakers, blacksmiths, caulkers, boat builders, and laborers were recruited from Pittsburgh, Philadelphia, and elsewhere. Materials to construct the vessels were imported from other regions of Pennsylvania including iron from Meadville and Pittsburgh; canvas for sails from Philadelphia; rigging, cannon shot and anchors crafted in Pittsburgh. The cannon were brought from Washington, D.C. and Sacketts Harbor N.Y. Because there were no sawmills, the lumber had to be cut, hewed, and squared by hand. Daniel Dobbins, a Great Lakes shipmaster living in Erie, was assigned by the Navy to direct construction until experienced builders arrived. In February 1813, Commodore Isaac Chauncey, Great Lakes Naval Commander, hired Noah Brown, a New York shipbuilder to complete the six vessels. Brown also designed two of the four schooners and the two brigs, Lawrence and Niagara. In March 1813, Commodore Oliver Hazard Perry took command. By late July, Perry completed the vessels and raised volunteers to augment his sailors. A significant number of the skilled sailors were free blacks, many landsmen and soldiers were also enlisted due to a shortage of men. On August 1, the British squadron withdrew its blockade and the American ships emerged from Erie harbor. For the next month Perry trained his crews and watched the British squadron at Fort Malden, Ontario (Amherstburg, near the mouth of the Detroit River). After the war, Niagara served as a station ship in Erie until 1820, then was scuttled there in Misery Bay. To celebrate the centennial of the battle in 1913, Erie citizens raised the hulk and rebuilt her, using many of the old timbers. Niagara, towed by the USS Wolverine, visited Great Lakes ports and participated in ceremonies at Put-in-Bay on September 10, 1913. Following the commemoration, Niagara returned to Erie. In 1931, the state took custody of her and began a major restoration that was delayed by the Great Depression. Her hull was completed in 1943; masts and rigging were finally installed in 1963. By the early 1980s the Niagara was again severely decayed. International Historic Watercraft Society was contracted to design and build a reconstruction of the Niagara. The present ship is a new vessel, incorporating both known and conjectural design features. Some original timber is installed in non-structural places. On September 10, 1988, the Niagara was launched in Erie ceremonies marking 175th anniversary of the Battle of Lake Erie and the ensuing peace between the United Kingdom and the United States.